The Silence draws on some classic apocalyptic motifs and tropes, like the main characters’ choice of clothing (jeans, combat boots and an earthy-toned jacket seem to be the favoured end-of-the-world ensemble), imagery of abandoned cars piled bumper-to-bumper and dead bodies littered on the front lawn. If you sprinkled in a few growling zombies, you might as well be watching an episode of The Walking Dead. While it does have its fair share of clichés, the film also has some strong points. Just an important note: this is not a horror flick. If you went in expecting blood and gore, you’ll probably be disappointed. This film’s a better fit for the sci-fi/thriller category. 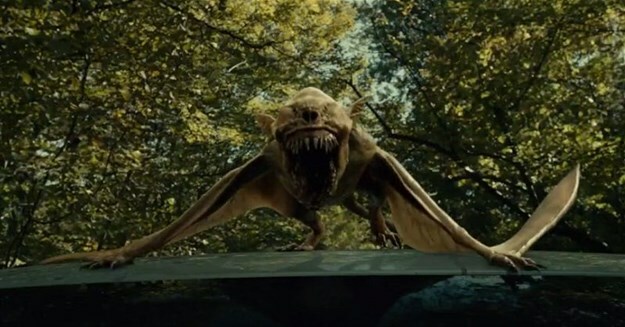 The ‘villains’ of The Silence, are flying creatures called vesps. These prehistoric reptilians were freed from an ancient rockfall during a cave expedition. Because they were completely deprived of sight, these predators have incredible hearing. If they’re near enough to hear you, you’ll be torn limb from limb in a matter of minutes – trigger-happy characters are among the first to die as vesps flock toward gunshots as fast as you and I would flee from them. As far as monsters go, vesps aren’t very terrifying. They, in fact, resemble a flying dinosaur (dimorphodon) from the early Jurassic Period. It’s the ordeals the Andrews family face on their travels that could give you nightmares. Stanley (Hugh Andrews) tries to protect his family as they seek shelter in a world on the brink of collapse. Sixteen-year-old Ally (Shipka) lost her hearing three years ago and the rest of the family have all learnt sign language: a tool that helps them communicate without being detected. As people turn on one another, the Andrews fight to keep their humanity and compassion. In a universe where your life depends on sound judgement, they fare quite well. Stanley is a level-headed father, someone who can make difficult decisions when others can’t. There are moments when I wanted to hate him for his actions, but after weighing up the options, I realised any rational human would probably have done the same in his position. After watching the brave dad voluntarily scope out all the dangerous areas first, you start expecting him to single-handedly save the day. But every man, woman and child – from the young to the very old – pull their weight to survive. Sacrifices are made and the Andrews overcome their obstacles by staying calm in a world that would eat them alive. Along the way, they meet a few people including a cult leader with a penchant for mutilation. The Silence has certain gaps in it, but they’re not big enough to poke holes in the plot. For example, why are the vesps not drawn to a loud crash, but they suddenly descend when the soft beep of an unlocked door is activated? Luckily, the film moves too fast for me to linger on its flaws. There are, however, disturbing images that have been etched into my brain. The Reverend/cult leader with his black robe and beard made me so uncomfortable I had to hit replay just to make sure I’d not imagined what I’d just witnessed. And while the vesps themselves may not be so scary, their habits are pure nightmare fuel. 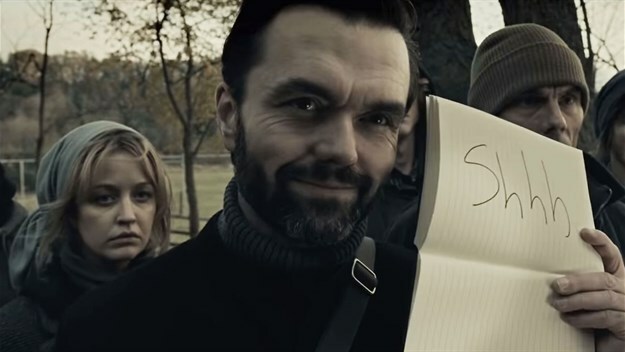 But the most terrifying thing in the entire film are four simple words scrawled on a page in a book. These words are enough to make Stanley fetch his rifle. You’ll be on the edge of your seat for the final 20 minutes. If this film’s supposed to be a horror, then it’s one of the fluffiest I’ve ever seen – all the really gruesome scenes are either censored or completely cut. What did impress me were the family’s overall ingenuity and their ability to act fast and use whatever’s at hand to survive. I reckon there’s potential for a post-apocalyptic sequel, but they’ll have to improve their vesps the second time around. I’ll admit, for a while after watching The Silence, my heart skipped a beat at sudden noises. I’m sure no images of flying monsters will sneak into my dreams tonight, but I think I’ll keep my phone on silent for the next week or so. You know, just to be safe. Ayesha is a self-confessed bibliophile. When she's not reading stories, she's writing them. This former teacher and editor is a diehard Potterhead. Currently she's completing her MA in Creative Writing. Ayesha will almost always choose tea over coffee, and writes articles when she's supposed to be working on her thesis.